OGDEN, UTAH, March 27, 2017 – Ogden City and Grow Utah began their “LIFT” startup accelerator program last week at a public reception. LIFT is an eight-week startup accelerator designed to elevate the success of Utah’s outdoor product innovators. 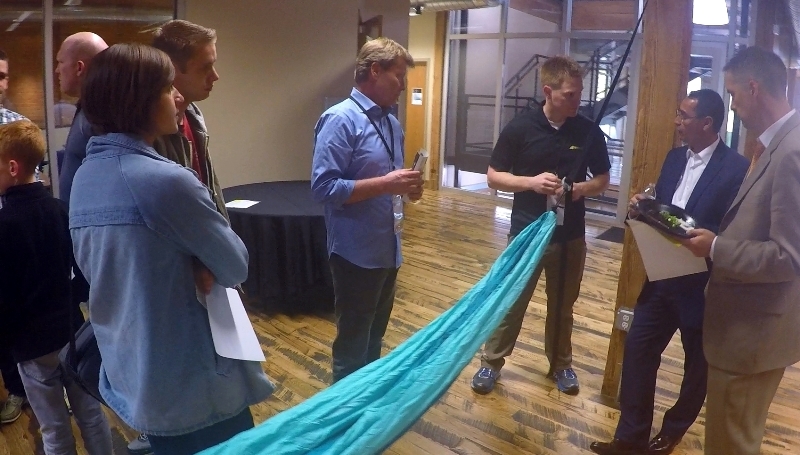 Seven Utah outdoor rec startups have been selected and are now participating in the mentorship and training program that will end with $20k loan from Ogden City to grow their business. LIT Outdoors: a lightweight tent that supports a hammock without the need for trees. Zipper Hammock Hanging System: a small device that makes it super easy and quick to attach a hammock to a tree. “We are excited to be accepted into this program”, said David Rupp of Drift Boards. This program will help us understand exactly what we need to do to succeed and get to the next level. It’s really exciting and challenging to take a new product to market in the outdoor rec industry. We are excited and grateful for the opportunity to work with expert mentors from LIFT”, he added. The program application process was open to entrepreneurs from across the state with seven finalists being selected for the first cohort. Over the eight week course, selected entrepreneurs will be immersed in intensive mentoring and training, provided by experts in the outdoor recreation industry. Ogden City will provide the companies with a $20,000 micro-enterprise loan to be used toward eligible business expenses. Ogden City officials encourage these businesses to remain in Ogden long-term and become part of Ogden’s strong outdoor business cluster. “Ogden City is thrilled to be part of this program”, said Ogden City Mayor Michael Caldwell. “Ogden has become nationally recognized as a hub for outdoor enthusiasts and businesses. From attracting major outdoor product companies to hosting world-class events, outdoor recreation has catalyzed the revitalization of Ogden. Access to the outdoors as well as our community of enthusiasts makes Ogden a great environment for new product design and innovation. We want to make Ogden not only the best place to play outdoors, but also the best place to successfully launch a startup business in the outdoor products space,” Mayor Caldwell concluded. The growing list of outdoor recreation companies headquartered, or strongly established in the Ogden area, includes Salomon, Suunto, Atomic, Scott USA, Rossignol, Osprey Packs and more. Some of those companies will be providing mentorship to the LIFT program such as the booming ENVE Composites, a bike company which just opened their new manufacturing facility near downtown Ogden. Kickoff for the LIFT program began with a public reception on March 23rd in downtown Ogden. The program will conclude on May 4th with a public release of the products, which will help position the participants to obtain follow-on funding from investors. “We are confident these companies will go on to do great things as a result of this program”, said T. Craig Bott, President & CEO of Grow Utah, a privately funded non-profit. “Over the past eight years we have cultivated outdoor product startup companies through our Concept to Company Innovation Contests. The LIFT program takes companies to the next level by surrounding the innovators with startup experts, prototyping and design specialists and industry mentors. This will give these innovators what they need to be successful and the end benefit will be new Ogden-based startups that grow this exciting industry cluster in Utah,” he added. In addition to Grow Utah and Ogden City, several entities are supporting or sponsoring the LIFT program. BoomStartup is providing the curriculum and online training platform for the entire program. Other sponsors include: financial support from Durham Jones Pinegar, Mountain West Small Business Finance, USTAR and GOED’s Office of Outdoor Recreation; startup services from Startup Ogden; prototyping support from the WSU Concept Center; accounting support from Advanced CFO Solutions; research support from VentureWrench; other mentoring and support services from outdoor industry representatives. In recent years, Ogden has experienced a major renaissance, with the revitalization of its downtown and the growth of many industries. Key industry clusters are outdoor recreation, aerospace and advanced manufacturing, and information technology and software. Ogden offers the benefit of strong industry clusters, unique innovation assets, a young, well-educated workforce, and high-quality, low-cost locations. As a result, many businesses and residents have decided to call Ogden home. Ogden City’s community and economic development department makes the community stronger by creating and utilizing physical, financial, and social assets to generate improved and broadly shared economic well-being and quality of life.